Where seen? 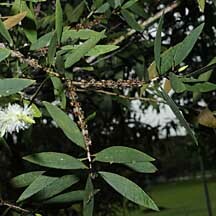 This native tree is the source of a medicinal oil called cajuput oil. Some trees are planted at Chek Jawa. According to Corners, it was common in Malaya, "especially in swampy ground near the coasts." According to Hsuan Keng, Ridley observed that "Kampong Gelam may perhaps have taken its name from trees formely growing here". It was also found in Seletar. 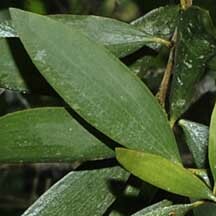 Also referred to as M. leucadendron. Features: A tall tree (15-20m) with a narrow, dense crown. Leaves (5-9cm long) dull green, thick, leathery smooth, oval or elongated with 5-7 longitudinal veins. 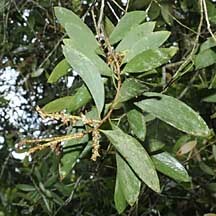 The leaves resemble those of an Acacia. The leaves give off a typical 'tea-tree' smell when crushed. 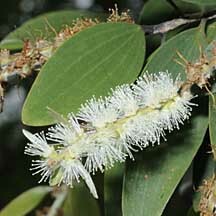 Tiny flowers are creamy-yellow emerging on a long spike in the shape of a bottle-brush. New leaves grow on the flower spike. 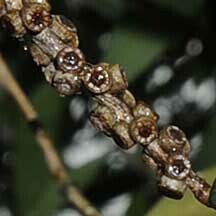 Fruits are round brown woody capsules in tight clusters and may remain on the tree for several years. They split open to reveal minute brown seeds. The trunk is often gnarled and twisted. 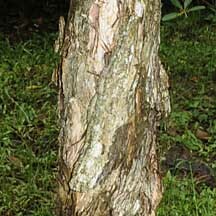 The thick spongy bark is whitish to greyish brown ('Kayu putih' means 'white wood' in Malay) and may peel off in large flakes like sheets of paper. 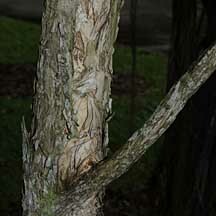 So it is sometimes also called the Paper bark tree. 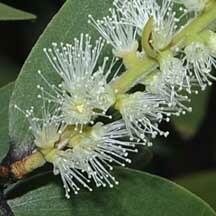 A hardy tree that grows rapidly and can withstand poor waterlogged soils, wind, heat and even withstand fires, it can become an invasive weed where introduced outside its native range. 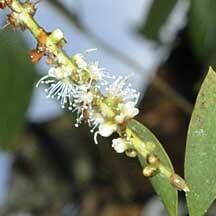 Human uses: The leaves are used to distill 'cajeputi' or 'tea-tree oil' which has medicinal and antiseptic uses. 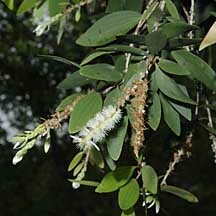 According to Wee, the Burmese use it to treat gout, the Indochinese to treat rheumatism and joint pains, the Malaysians to treat colic and cholera, the Indonesians to treat burns, colic, cramps, skin diseases, wounds and various aches and pains. The pinkish-brown timber has a uniform texture and is popular for use in carving, cabinet work, boat building, fencing as well as for fire wood. The bark flakes are used for insulation and for stuffing pillows. According to Corners, the timber is hard and durable and is used as the main firewood where bakau or mangrove wood is unavailable. 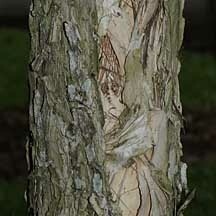 The papery bark is used to caulk boats as the bark swells in water, thus sealing seams. The dried fruits are sold as a spice. Planted along the visitor trail. Tee Swee Ping and Wee Mei Lynn (eds). 2001. Trees of our Garden City. National Parks Board. 202 pp. Hsuan Keng, S.C. Chin and H. T. W. Tan. 1990, The Concise Flora of Singapore: Gymnosperms and Dicotyledons . Singapore University Press. 222 pp. Corners, E. J. H., 1997. Wayside Trees of Malaya: in two volumes . Fourth edition, Malayan Nature Society, Kuala Lumpur. Volume 1: 1-476 pp, plates 1-38; volume 2: 477-861 pp., plates 139-236. Burkill, I. H., 1993. A Dictionary of the Economic Products of the Malay Peninsula . 3rd printing. Publication Unit, Ministry of Agriculture, Malaysia, Kuala Lumpur. Volume 1: 1-1240; volume 2: 1241-2444. FREE photos of coastal plants. Make your own badge here.